Stereo views, or stereographs, are the double-views that were used as parlor entertainment starting in the mid-1850s. 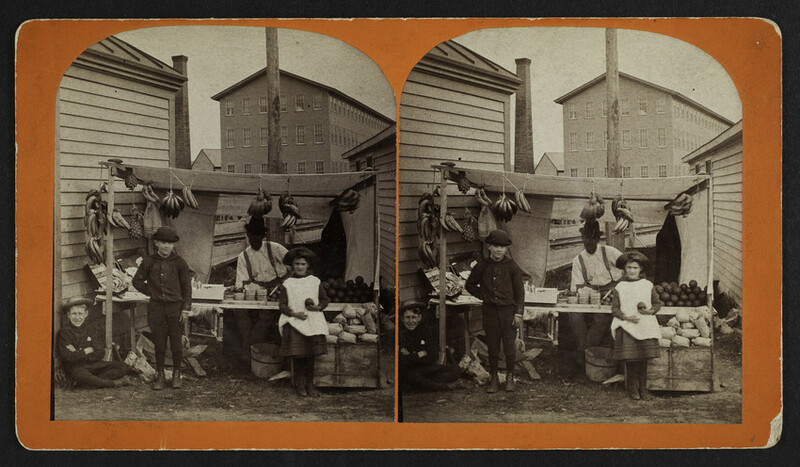 The Stereo views series of the General Photographic Collection contains more than 10,000 items, dating from the late 1850s to the mid-1880s.The emphasis of most stereographic photography was on the "here and now," rather than on the evocation of New England's past. In this sense, they are an exception source for the study of mid-nineteenth-century business blocks, town centers, parks, the homes of prominent individuals, factories, mills, and public works, which signified the "march of civic progress" so dear to Victorian pride. Historic buildings, other than those associated with literary or patriotic figures, tend to be less well-represented, though the practice of posing local residents in front of their homes and businesses provides occasional glimpses of the architecture of the late-eighteenth-century to early-nineteenth-century, especially in non-urban areas.The majority of the stereo views are arranged by localities. Boston is particularly well covered by nearly 1,500 views of churches, streets, public buildings, the harbor, and parks. In some cases, these scenes are intertwined with noteworthy events, such as the Peace Jubilees of the 1860s and early 1870s, the Centennial parades of 1876, and the tragic aftermath of the Great Fire of 1872. The last mentioned event is extensively documented with several hundred views, arranged by streets.Outside of Boston, the best represented communities include: Portland, Maine; Newport, Rhode Island; and Newburyport, Lawrence, Lowell, and Oak Bluffs, Massachusetts. Many industrial and manufacturing subjects are depicted. In Oak Bluffs, the coverage of camp meetings and the cottage architecture which replaced the earlier fanciful tents with equally fanciful building forms is of especial interest. There are more than 1,000 stereos of scenery of the White Mountains in New Hampshire, hotels, and popular tourist attractions, including the construction and completion of the Cog Railway. These images range from the early views of the Langenheims of Philadelphia in the late 1850s to many hundreds by the Kilburn Brothers of Littleton, New Hampshire, made in the 1870s and early 1880s. John Soule, Nathan W. Pease, and the Bierstadt Brothers are only a few of the other major photographers whose works are part of the collection. Source: Guide to the Library and Archives, 3-4. This series is organized in three sub-series: geographic locations, subjects, and photographers. The stereos depicting the Great Fire of 1872 are arranged by street names. All of the White Mountain items are arranged by individual photographers and subdivided by subjects.